Which climate zone do you garden in? What zone do you live in? This may seem like an odd question, but the answer is one of the most important guides to knowing which plants will thrive in your garden. A variety of maps, including some new ones, can help you find the information you need. 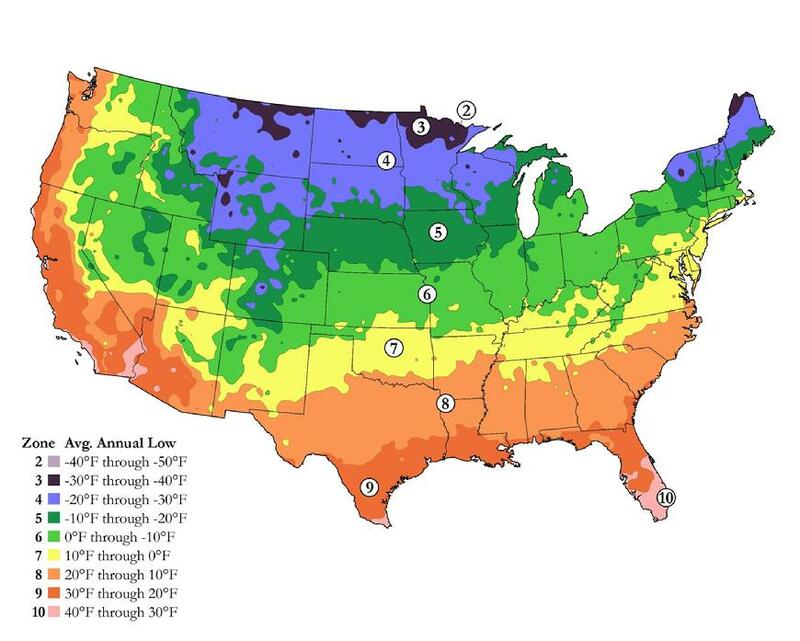 Understanding climate zones is critical for selecting permanent landscape plants. If you want a shrub, perennial, or tree to survive and grow year after year, the plant must tolerate year-round conditions in your area: the lowest and highest temperatures, the amount and distribution of rainfall (or availability of irrigation), and soil conditions. In eastern North America, the most commonly used zone map is the United States Department of Agriculture (USDA) Hardiness Zone Map, devised in 1960 and revised in 1990. On the Internet, the most commonly used zone map is from National Gardening. This article explains the origins and uses of climate zone maps, including those four. Gardening references include many kinds of climate zone maps. For instance, vegetable gardeners might consult maps that show the average dates of first and last frosts or perhaps the amount of sunshine or rain their regions receive. But the most common zone maps are those that show where various permanent landscape plants can adapt. Perhaps the safest course to ensure plant adaptability is to grow only plants native to your particular region. Native plants have proved they can survive in your climate. However, plants don't stay in their regions of origin any more than gardeners do. Plants native to China, Siberia, and Mexico thrive alongside each other in many American gardens. Furthermore, a California gardener may want to grow a plant that's native to the Great Plains. In such cases, gardeners need a way to compare their garden climates with the climate where the plant is known to grow well. Zone maps provide critical climate information. Zone maps are fairly recent innovations. German geographer Alexander von Humboldt created the first one in the early nineteenth century. Humboldt used lines, called isotherms, to delineate regions of equal temperatures. In 1927, horticulturist Alfred Rehder created a system of eight isothermic zones for most of the United States, with each zone separated by temperature differences of 5 degrees F. He was the first to relate average winter minimum temperatures to the hardiness of specific plants. In 1931, German geographer-meteorologist Vladimir Koppen published a zone map divided into regions that share similar native vegetation. By studying and classifying vegetation types, Koppen ensured that his map accounted for rainfall, humidity, elevation, soils, and the myriad other factors that affect plant growth. All of the climate zone maps in use today derive from these two prototypes.